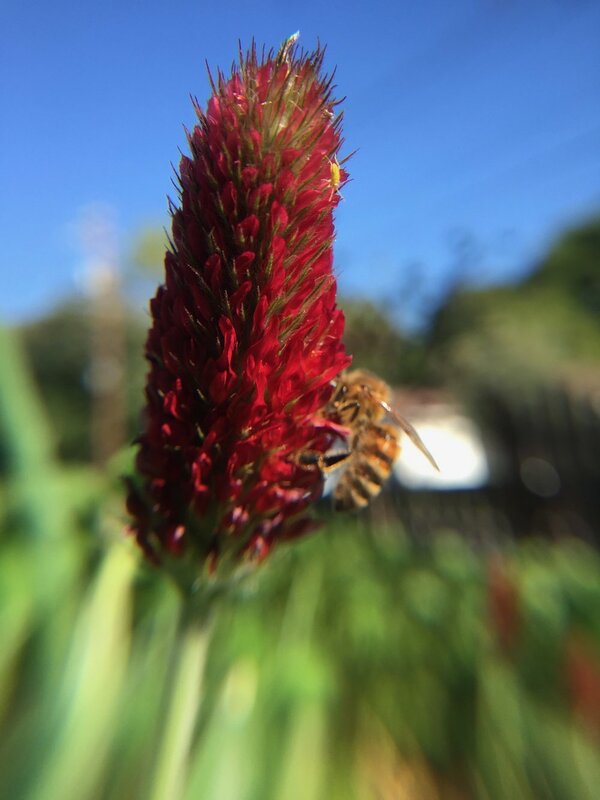 I've already written about the excellent cover that our wheat/oat crop provided for the vegetable beds over the winter, but I failed to mention that I also seeded crimson clover at the exact same time I seeded the wheat, with the hope that it would provide nitrogen over time to other plants. It's done well everywhere I planted it, except the garlic bed, for some unknown reason. You can see it flourishing in the picture above. It's a lovely cover crop. But today I cut most of it down, because it's finally tomato-and-pepper-planting-time, hooray! However, before the clover is relegated to compost, chickens, or mulch, I wanted to show you what it can do for you in your garden, and why I planted it in the first place. There's a huge amount of nitrogen in the air around us, but it's in a form that is very difficult to access because it has a very strong bond. As you probably know, lightening can break apart those bonds and cause nitrogen to become available to plants in rain. Also, the Haber-Bosch process, used originally to make bombs, is what makes synthetic nitrogen for fertilizers now (like Miracle Gro). This process requires a huge amount of energy and personally I will never use synthetic nitrogen for many reasons including that one. However, some plants have evolved to provide their own nitrogen; those in the Legume family have this skill. Clover is a legume, so like every plant in that family, it has the ability to form a relationship with a special bacteria which provides nitrogen to the plant. This rhizobia bacterium, when invited by the plant, invades the roots of those leguminous plants. The plant gives up some carbohydrates in the form of sugar exudates to the rhizobium, which in turn makes tiny anaerobic nodules on the roots which have the ability to fix nitrogen. Those are the pink nodules you can see on the roots above. This nitrogen generally is fixed within the bodies of the bacteria, and doesn't become available to other plants (through the soil solution) until the plant is cut down and the roots decompose. It's important to time all of this correctly: You want to grow the leguminous plants until nitrogen has been fixed, then cut off the tops of those plants before they set seed (if the plant sets seed, it has used up all the nitrogen stores for itself), and allow the tops to compost in place on the soil, while the roots and nodules decompose deep within the soil. The nitrogen-fixing ability is true of any leguminous plant - clover, peas, vetch, favas, alfalfa - as long as the bacteria is present, which it is in healthy soil. You can allow them to bloom and feed the pollinators, but chop it before it sets seed. Then mulch the next set of plants with the tops that you've cut off. Above are my sweet peppers, the soil totally covered with the clover tops. These will decompose in place, allowing nutrients back into the soil. You don't have to mix them in, the soil microbes will do that work for you. And as they break down, they will retain moisture, shade the soil, and prevent weeds from germinating. Plus add nutrients naturally! Meanwhile, it makes a beautiful flower display that my bees adore! I've had such success with winter cover crops this year that I intend to use them every year; I'll just plant them within the rows of vegetables. I'd like to figure out how to do this with a summer cover as well. Buckwheat works well here as a summer cover and I've used it before by itself; the trick is to use it in between the growing food crops. I am doing a little of this already using intercropping with other vegetables. For instance, I'm growing pumpkins and butternut squash underneath the corn, and basil around and in the hot peppers. I'm always worried about growing anything below the tomatoes because of air circulation; but I have all our wheat and oat straw to cover the soil there. Beans and cucumbers quickly cover the soil with their own leaves. Have you used cover crops or intercropping in your garden? If so, I'd love to hear about your results. Please share in the comments.